COOK YOUR FOOD. HEAT YOUR WATER. WARM YOUR HOME. We are a family business, hand-crafting high quality cast-iron wood stoves that are designed and built to last. 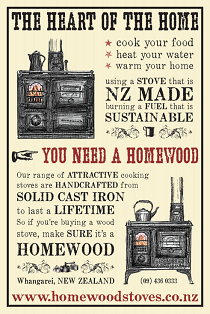 We are New Zealand’s only cast-iron cooking stove manufacturers, 100% NZ owned and operated, using only local foundries and suppliers. Our cooking stoves run on wood, a renewable and sustainable fuel source that you can have direct control over to be truly self-reliant and energy-independent. We’ve incorporated a timeless and traditional aesthetic with modern technologies to produce heirloom stoves that perform beautifully, burning cleanly and efficiently, while still looking gorgeous and warm. Check out our range, watch our videos, read feedback from a bunch of our satisfied customers, grab installation specifications, and get in touch when you’re ready to put your very own Homewood on order! Keep your family warm, fed and in abundant supply of hot water: join the Homewood way of life!